Our first ride with the Suzuki GSX-S750 at the Buddh International Circuit (BIC) was with the last lot of riders for the day, so when we rolled into the paddock, other riders were already wringing out the 749 cc, in-line four motor on the back straight. I like the sound - it's sweet, in a sort of high pitch wail which is immediately endearing. After all, a performance motorcycle should sound the part. So, the new Suzuki GSX-S750 got my vote for the music it makes, even before I got to straddle the bike. But then, there are other so-called entry-level and even middleweight performance bikes in the market which are all sound, but no go, so I reserved my enthusiasm (or disappointment, whichever the case may be) for later, till after I get to spend a few laps at the BIC astride the GSX-S750. Will it be as endearing a performer as it sounds? Will it have the zing, that extra something, which makes a good bike truly special? Or will it leave me wanting for more? Getting out of the pit lane, I took my time babying the GSX-S750 for the first few corners. But then the intake whine of the in-line four with the wailing exhaust note became just too tempting to get into a steady groove. Performance is silky smooth, just the way a Japanese in-line four is expected to be, gearshifts are slick and precise, and the rev limiter kicks in as I accelerate through the gears on the back straight, before it's time to brake hard and take the right hander into the fourth corner of the circuit. There's no slipper clutch, but the clutch isn't so heavy to give your hand a workout, particularly in everyday riding situations. How it handles the urban grind will be a different story altogether. 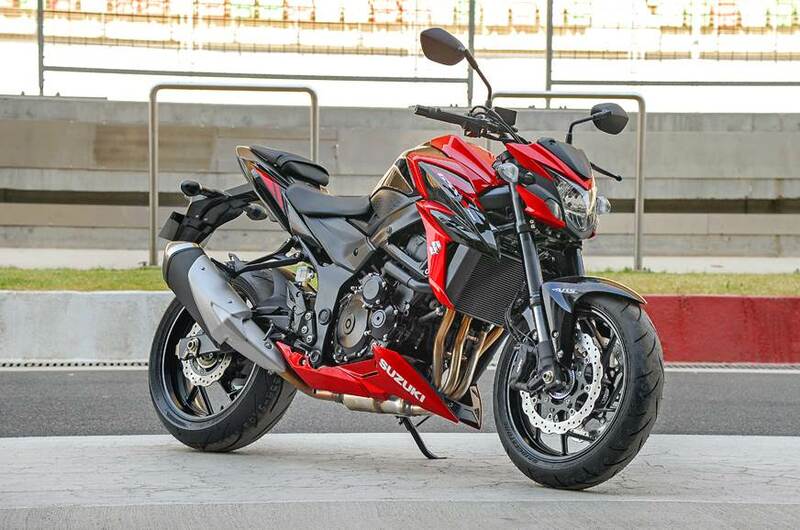 The Suzuki GSX-S750 is no lightweight naked. Weighing 215 kg in the wet, you can feel its mass at slow speeds; after all, it's more or less the same dimensions as its bigger sibling, the GSX-S1000. In fact, you could be fooled into thinking it's the S1000, before you notice the S750 badge on the muscular tank. It has the same design overall, muscular and sculpted tank, nice looking headlight, with fat upside down forks and a lean tail section. But on the move, all that weight seems to disappear magically. Turn after turn, the GSX-S750 gives you more confidence to turn in faster and smoother, and it begins to make you trust the bike's capability after each and every turn. The 749 cc motor has been derived from the K5 GSX-R750, but has been re-tuned for better mid-range grunt. The numbers are 112.6 bhp at 10,500 rpm, and 81 Nm of peak torque at 9,000 rpm. And it's got enough performance to make it a very likeable motorcycle. It's not intimidating like the S1000, and it has more than enough punch to make it a very lively and entertaining track tool. Lap after lap, the GSX-S750 made the late afternoon at the BIC a very enjoyable and entertaining outing. Does it have enough electronic rider aids? The GSX-S750 gets a similar LCD instrument panel as its bigger sibling, and then there's the three-level traction control system which ensures there's a decent safety net to hold you back if things begin to go a little out of hand. In fact, so forgiving is the bike's handling, you tend to overdo your limits (and talent), but there's no 'Oh my God!' moment, and it dips from left and right with impressive ease of handling. In the initial lap, I did feel the rear bucking a bit, probably with the traction control dialled out to newbie level, but level 1 helped dissipate any more doubts with the rear twitching or bucking, even with ample throttle input. For newer riders, or for those upgrading to their first performance naked, this is a valuable safety net which will work wonders, on the street, on wet roads and for that occasional track outing. Brakes are fantastic, and despite the bikes being thrashed around the circuit all day, there's ample bite and progression to keep things well in control and shave high triple digit speeds in a jiffy, thanks to the eight-level ABS, and the 310 mm twin discs up front, gripped by Nissin four-pot radial calipers. Gunning down the back straight, and slowing down to take the fourth corner is without drama, as the brakes effortlessly shaves off speeds in excess of 200 kmph. And yes, I saw the speedo touch more than 200 kmph, and it could probably go a few more kmph in the right hands and a lighter rider. Is it the perfect middleweight naked then? The Suzuki GSX-S750 is a lovely motorcycle - period. It looks good, without being over-the-top, sounds absolutely amazing, and has the perfect combination of performance and handling to make every ride an enjoyable one. Yes, it doesn't have the performance of a 200 bhp, litre-class superbike, but how much power do you really need to make you feel special? What it makes up for is in its practicality; after all most riders will be riding it on the street, but it has enough performance and more for the occasional outing on a racetrack. It's got more than enough usable power, and its performance is not at all intimidating to scare you silly, while giving you a thoroughly enjoyable time. At ₹ 7.45 lakh (ex-showroom), the Suzuki GSX-S750 competes squarely against the Kawasaki Z900 ( ₹ 7.68 lakh) and even to some extent, the Triumph Street Triple S ( ₹ 8.71 lakh). The Kawasaki has its own qualities and makes for a super silky performance naked, but it lacks any electronic rider aids to speak of, except ABS. And for riders who are looking to upgrade to their first 100-plus bhp motorcycle, which costs under ₹ 10 lakh, the Suzuki makes a very compelling case for itself, and makes for more than just a second glance. It may not be the magical performer which wows you immediately, but spend some time with it, and it begins to grow on you and has all the qualities to make it a very attractive middleweight performance naked. It could be the perfect bike to graduate to from a smaller 40-50 bhp motorcycle, and could also make for a very capable first performance bike for someone getting back to motorcycling after a long hiatus, and looking for some serious fun on two wheels. Only thing left then, is to see how it behaves out in the real world. For now, I'd say, well done, Suzuki! All I want now is some more seat time with the new Suzuki GSX-S750! # Basically it is designed in such a way that it protects for all indicators and body from Back as well as from front side of the Scooter. # Stainless Steel Guard kit gives Protection and Sturdy Looks to your Scooter. # It's focused on the customized fitment as per scooter model. # Its fine finishing enhances looks of the vehicle and gives unique character to your Scooter.Fitment - Product comes with long lasting fitment screws and bolts and need to be installed with the help of same firmly.Colour - Steel grey (Glossy finish)Packaging Contents- 1 set of stainless Steel Guard kit for Activa 3G scooter.